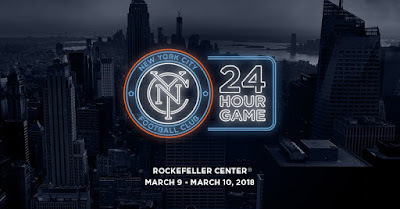 “New York is The City That Never Sleeps, so we’re inviting New Yorkers of all skills to an around-the-clock soccer game to launch the Club’s fourth season. The five-on-five game will play through a 24-hour duration, with participants on rotation and a DJ entertaining the crowd. In addition, Head Coach Patrick Vieira, Team Captain David Villa and other players from NYCFC are scheduled to lend their coaching skills to participants during the start of the event. “Soccer is great because it brings people together and you can play in any space. It will be amazing to play with so many people in the middle of Manhattan that I am proud to call my new home. By the end of the game, it is going to be a very high score and I hope my team finishes on top. NYCFC will be collecting donations to support City in the Community (CITC), the nonprofit foundation proudly supported by NYCFC that uses the power of soccer to promote health, education and leadership development and safe spaces throughout the five boroughs. *Registration for time slots to play is now open at http://www.24hrgame.nyc/. On-site registration during game time is also available. Players must be 18+ years of age, but all are invited to attend the event. Join the conversation on social using #SoccerNeverSleeps. Thanks for the auspicious writeup.I am looking forward on your next post, I’ll attempt to get the hang of it! .A debt of gratitude is in order for the post. I'll unquestionably return.